If you’ve ever had the pleasure of receiving professional massage therapy, chances are you are aware of its many benefits. Whether you’ve been prescribed massage therapy due to injury or prefer regular sessions with your massage therapist to promote relaxation, there’s no doubt that regular massage therapy can serve many purposes. 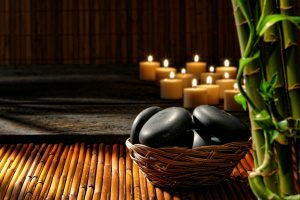 From Swedish to prenatal massage, the massage therapists at Radiance Day Spa in Sioux Falls specialize in a variety of massage techniques that are sure to relax, detoxify, and balance your body. Today we’ll take a look at some of the benefits you can reap from regular massage therapy. Most people enjoy the blissful feeling of skilled hands kneading away their stress and anxiety. Have you ever wondered what it is about a great massage that leaves you feeling so wonderful? The answer lies in body chemistry! Studies have shown that regular massage can increase your body’s natural levels of oxytocin and serotonin. When oxytocin and serotonin are at or above normal levels, this results a feeling of less stress. The best news? The benefit of regular massage therapy doesn’t stop there. Regular massage therapy can also lower your blood pressure and heart rate, improve breathing, and lead to more sound sleep cycles. Give Radiance Day Spa a call today at 605-275-9535 to book a 50 or 80-minute soothing stone massage to melt away your stress and promote relaxation. If you are regularly under emotional distress or carry tension in your neck, shoulders, or back, chances are you’ve experienced headaches that have the potential to stop a productive day in its tracks. From slight headaches that are a minor nuisance to major migraines that last for days, there are many different types of headaches one can suffer from. To understand how massage can alleviate headaches, it is important to know there are two common causes of headaches: those caused by tension and those caused by vascular swelling and constriction. Regular massage therapy can relieve tension in the neck, shoulders, and back. When tension is relieved on the muscles, there is less pressure on the blood vessels that supply them. The result is increased blood flow to muscles and the likelihood of less frequent or less severe headaches. At Radiance Day Spa, our massage therapists are happy to review your individual symptoms in a customized consultation. Given the benefits we’ve just discussed, it’s easy to understand how regular massage therapy may be beneficial for those suffering from insomnia. A few years ago, the Centers for Disease Control estimated that nearly nine million adults were taking prescription sleep aids and that an estimated 50 to 70 million Americans suffer from sleep disorders or deprivation. Given that the pace of our world isn’t slowing down anytime soon, there is a high chance the current figures are even higher now than they were then. While massage cannot help all forms of insomnia, it can be beneficial for stress-induced insomnia. With regular massage therapy resulting in lower stress levels, why not give us a call to discuss how and if massage therapy could potentially help reduce muscle tension and high blood pressure and restore your body’s natural sleep cycle? If you’re like most people, you may not be aware that massage therapy has additional benefits beyond promoting relaxation, improving sleep, and alleviating headaches. Regular massage therapy is also great for preventing sprained ligaments, pulled muscles, and other soft tissue injuries. When muscle tissue is tight, blood flow through the tissue is poor and this can predispose you to injury. Regular massage and stimulation helps muscles retain good blood flow and relaxation. It also aids in exercise recovery, promoting the rebuilding phase of your conditioning workout. If you’d like to find out more about how regular massage therapy can benefit your workout or training routine, contact us to speak with one of our professionally trained massage therapists! If you’re curious about any of the benefits we’ve discussed today, we encourage you to speak with one of our certified massage therapists. We’ll take the time to listen to you and will work with you to create a personalized massage therapy routine tailored to your individual needs and budget. At Radiance Day Spa, we are committed to helping you on your journey to well-being by delivering a unique experience focused on physical, mental, and spiritual health. We can’t wait to work with you!